CLICK HERE to read note about the use of “frames” in Web Sites. Robert Alexander Long was born December 17, 1850 in Shelbyville, Kentucky. He was one of nine children born to Samuel M. Long and Margaret Kinkead White. Margaret was only sixteen years of age when she married Samuel Long. Her father had died and she was encouraged by her family to marry. She grew up on a grand Southern plantation and was strong willed and could be obstinate. These genes would help create Robert A. Long. Samuel M. Long owned 300 acres of farm land in Shelbyville, Kentucky and he was twenty-five years old when they married. 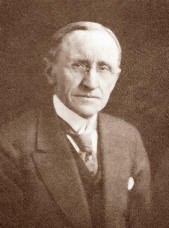 Samuel Long and his children worked the 300 acre farm and made it profitable. Robert A. Long learned at an early age that laziness was a carnal sin. His parents were deeply religious and his father served as a deacon at the Christian Church. They were strong in their church and its teachings, which included being very antislavery. Robert A. Long’s primary education was in a one-room country school house. From the age of fourteen to sixteen, he attended a preparatory school for boys. Robert A. Longs’ personality drove him to excel at whatever task came about. He had a photographic memory, which later was a standard part of his life. He could store pages of information in his head and recall it at will. He was deeply religious and a member of the Christian Church. This deep faith would mold his life. He abstained from alcohol, profanity and carnal sin. He did not smoke. Shelbyville, Kentucky was famous for purebred cattle and fancy saddle and harness horses. Long grew up in the era of rolling hill sides with grand and spacious Southern mansions. Going into town with his father, they would pass these estates. One of his favorite mansions was Walnut Hill. It was in the Greek Revival style with a two-story portico supported by five columns. All his life Robert Long equated columns and porticos with rank and power. He dreamed of opportunities in places other than on his father’s farm. His uncle, C. J. White, was a banker in Kansas City when Robert was twenty-two years old and decided to try his wings. With $700, a share of the farm harvest, in his pocket, he traveled to Kansas City and was welcomed into his uncle’s household. Various jobs did not come about and his savings were nearly gone when his uncle suggested Robert and his cousins, Robert White and Victor Bell start a hay business. He suggested the boys cut wild grass in Kansas and sell it. They cut tons of hay and bought a few carloads of lumber to make sheds to protect the hay from winter. It was 1872 and the grasshoppers devoured everything and only the prairie grass survived. However, the boys cut the hay too late and it was worthless. They were able to sell the lumber from the shed and a new business was born! His life is the ultimate American dream. A boy from the farm with an austere persona, who also could seize on unique opportunities that eventually would bring him opulence and wealth, that enabled him to enjoy his love for the luxurious lifestyle of the Old South. The lumber business was not his only career interest. Everything interested him! Also in Columbus, Kansas, Robert realized there was money beneath his feet, coal mines – it made good sense to own coal mines. He acquired 1520 acres and sank two shafts at Stone City. These mines brought in a great deal of profit. In 1874, Robert A. Long met nineteen year old Martha Ellen Wilson. She had grown up in Pennsylvania and her father had died at the age of forty-live, leaving her mother with eight children to rear and many debts. So, Mrs. Wilson had moved the family to Columbus, Kansas, staked a claim and established a farm. Martha Ellen, Ella as she preferred to be called, was a Quaker and became a school teacher. Her parental background was as stern and staunch as Robert Long’s. Mr. Long and Ella dated, or courted as they said in those days, for one year. They married December 16, 1876. Their first and only son lived but a few weeks. Sallie America was born in 1879 and Loula in 1881. Mr. Long enjoyed his wealth and shared it with his wife and daughters. He built a large Queen Anne house with verandas, stained glass windows and gardens. There was a stable with ponies for his children and a fine carriage pulled by a pair of handsome bays. He was doing well and the next move had to be his return to Kansas City. On February 26, 1891, R. A. Long moved into the Keith and Perry Building in the heart of the Kansas City financial district. He acquired acres of timberland throughout Louisiana, Mississippi, Texas, Michigan, Wisconsin and eventually Washington State. He established his family in Kansas City, but it was not the Kansas City of today. It was sidewalks made out of boards, stockyards and packing houses, half a dozen saloons and cable cars inching up steep hills, clattering and lurching. The business district was four blocks long and there were two residential streets, one being Independence Avenue. Their new home was on the corner of Independence Avenue and Bellfontaine. The new house was large and spacious. The corporate expansion of Long-Bell Lumber accelerated. Now at the age of fifty-four, Mr. Long was active and tireless. At the St. Louis World’s Fair, Mr. Long saw the Pullman Palace Railroad Co. train. He had to have one to travel back and forth to Washington. There was a stateroom, drawing rooms, sleeping cars for six passengers and a dining car with a kitchen. The crew included a cook, steward and a maid for Mrs. Long. The Long-Bell Co. was operating 269 railroad cars including seventeen locomotives to haul timber from logging areas to sawmills. Rolling stock consisted of seventy-seven flat cars, four steel cars, eight boarding cars, four powerful locomotives and two red cabooses. Now, it was time to move to an even larger home with a larger stable. Henry Ford Hoit was commissioned to design this new abode. Mr. Long had eyed property at the crest of a hill known as Scarritt Point. It was in the heart of a neighborhood of aristocratic character. Two years would pass before he acquired enough lots for the square block for his mansion. He also purchased four lots nearby for a garage and a large exercise ring for the horses. There was to be the main house, a gate house for the Long’s horse trainer and his family and a two-story stable complete with a harness and tack room, a white-tiled wash room and a lift to take carriages to the storage loft. A high wrought-iron fence would surround the entire site with six pairs of high wrought-iron gates installed between cut-stone pillars crowned by large copper lanterns. The mansion would be three stories with an attic. It would have a front portico with six columns of solid limestone. It would be called Corinthian Hall. During the next years, Long-Bell expansion accelerated. Mr. Long was active and tireless. He was the King of the Yellow Pine Industry. Now, Mr. Long decided the offices at the Keith & Perry Building were too small. He and his staff needed more room. He decided to build his own “office tower.” Choice downtown real estate was available on Grand Avenue & 10th Street. It was impressive – 16 floors in the Beaux-Arts style. It contained 300 offices. All tenants enjoyed 6 high-speed elevators. The R. A. Long Building was the first tall building in Kansas City constructed with an all steel-skeleton frame. The building today is the United Missouri Bank Building. The Gilded Age lasted from the Civil War until World War I. That is when federal income tax began to be collected by the U. S. Government. The lumber business was not Long’s only career interest. Mr. Long was serious and intense in his work ethic. He was brought up in a pious family which in his adult years proved to be an exemplary layman of the Christian Church. He led fund raisers for his church and his beliefs. He financed the building of churches and schools. He purchased a large publishing house for religious books of faith. Mr. Long was president of The Southern Pine Association, The National Lumber Manufacturer’s Association, The American Christian Mission Society, The National Brotherhood of Disciples of Christ, The Christian Board of Publication and The International Convention of Christian Churches. He was a part of Men & Millions Movement of the Christian Church and a Trustee of the Bible College of Missouri. He was an organizer of the Pension Plan and Trustee of the Pension Fund of the Disciples of Christ. He was the chairman and prime promoter of the World War I Liberty Memorial here in Kansas City, Missouri. In 1920, the Long-Bell Company bought a large body of Douglas Fir timber in the state of Washington. Here the company erected a huge lumber mill. The workers did not have adequate housing and Mr. Long knew his workers needed better living quarters. In 1924, he built a city for his employees and he named it Longview. Several years ago, Longview, Washington celebrated its 75th anniversary. When Mr. Long passed away in 1934, the Long-Bell Company had 13 lumber mills, 110 retail lumber yards, a sash and door factory and many warehouses. If http://www.ralonghistoricalsociety.org has opened this “version” of the “Home Page,” then your browser probably doesn't support “frames” as used in this web site. You may wish to upgrade your browser to the recommended Microsoft Internet Explorer or some other browser. Or you can use this non-frames “substitute menu” to get to the individual pages, but you will need to use your BACK button when through with each page to get back to this “substitute menu.” The individual pages will not be as well formatted as they are when viewed with a browser capable of using frames. by using the Contact Us page.